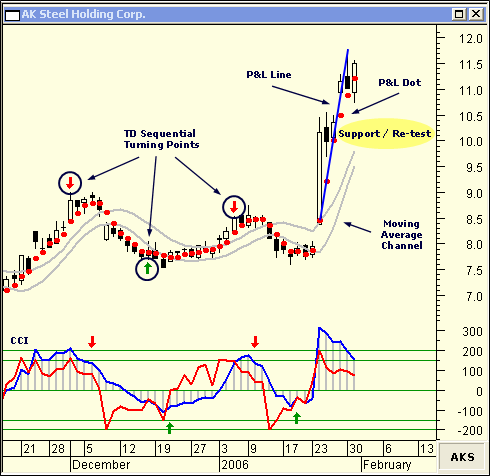 Chart Wealth... Steel Producers Show Impressive Gains! February 2006, Volume 3 Issue 2 Know It - Profit! "Steel Producers Show Strength... Firm Gains Fortify Industry"
Steel Producers have put in a solid base since June 2005... recently, outperforming the S&P 500. Is this industry ready to prove its mettle? Also... discover an exclusive method for timing stock trades. I'll show you the pieces to the puzzle. The Russell 2000 (^RUT) is up an impressive 7 percent relative to the other broad market indices. The Nasdaq Composite (^IXIC) is trailing the Russell 2000 by 5 percentage points... up just 2 percent year-to-date. The Dow Jones Industrials (^DJI) and the Standard & Poor's 500 (^GSPC) indices are lagging behind, with one-half and one percent relative gains, respectively. The PHLX SIG Steel Producers Index (^STQ) is red-hot... up 24 percent since last month! Also, making stellar gains this month are the PHLX Semiconductor Capital Equipment Index (^SEZ) and the PHLX Oil Service Sector (^OSX)... both marking a 15 percent increase. And... the AMEX Gold Bugs Index (^HUI) is up 15 percent for the month, as well. In this daily chart of AKS, I combined four technical indicators to help identify a possible area to enter a trade. First, on 1/26/2006 a moving average channel buy signal was generated when the second consecutive candlestick closed completely outside the channel. Next, I identified turning points based on Tom DeMark's Sequential. You'll notice it doesn't always pick the exact top or bottom. So, I use the signals as more of a yield sign... a point where I can begin looking for a candlestick reversal day. The oscillator at the bottom of the chart is derived from a short and long-term Commodity Channel Index (CCI) crossover. It's based on a trading system developed by Ken Wood. Don't let the name fool you. The CCI can be used on stocks, or any other tradable instrument. I'll reveal more about how I use the CCI in future newsletters. Stay tuned! Finally, as a confirming tool, I applied the Point and Line (P&L) charting technique... identifying the recent top on 1/30/2006. Created by Charles Drummond, P&L charting is a unique way of looking at market behavior. His geometric method has an uncanny way of nailing tops and bottoms. Sometimes, to the tick! So, if we are going to take a position with AKS, we should wait for a pull-back to the area of support... in the $9.75 to $10.50 price range. In the November 2005 issue of Chart Wealth, I said Newmont Mining Corp. (NEM) would reach a price target between $52 to $55. I hope this month's Featured Chart further expands your thinking about technical analysis and its unlimited possibilities. Although trend lines, Fibonacci extensions and Elliott Wave counts will serve you well, sometimes a new perspective will help you identify additional trading opportunities.